Click to read the original article by Robert McCabe, The Virginian-Pilot. NORFOLK | Recently, Lyon Shipyard has been awarded Navy Contracts worth more than $8 million to repair four “birthing barges” which act as housing quarters for crews of ships undergoing maintenance and repair work. The yard also won, along with Chesapaeake-based Tecnico Corp., a multi-year contract potentially worth $43 million that requires work on 12 Navy yard patrol boats. The state has also awarded Lyon a contract worth about $1.6 million to repair the ferry Williamsburg, which runs between Surry and James City counties. Thus far, the shipyard has won more than $321 million in government work from 1979 to May 2017. About $100 million of the amount came in over the past five years. Their success in winning these contracts make them stand out within Hampton Roads, the largest ship-repair and ship-building region in the country according to a 2016 U.S. Government Accountability Office report. However, Lyon’s goal isn’t to make a huge splash about their business. The yard prefers to keep a low profile. The company has continued steady work since it began, providing good-paying jobs to a couple hundred employees and up to maybe 70 contractors. Their work focuses primarily on the vessels that give the label, “brown water yard,” a shorthand way of saying that it’s a yard focused largely on tugs, barges and dredges, as opposed to so-called “blue-water” yards that deal with larger, ocean-going vessels. Lyon has on average about five or six tugs being worked on in a month, with an average of 22 jobs going on at any given time. 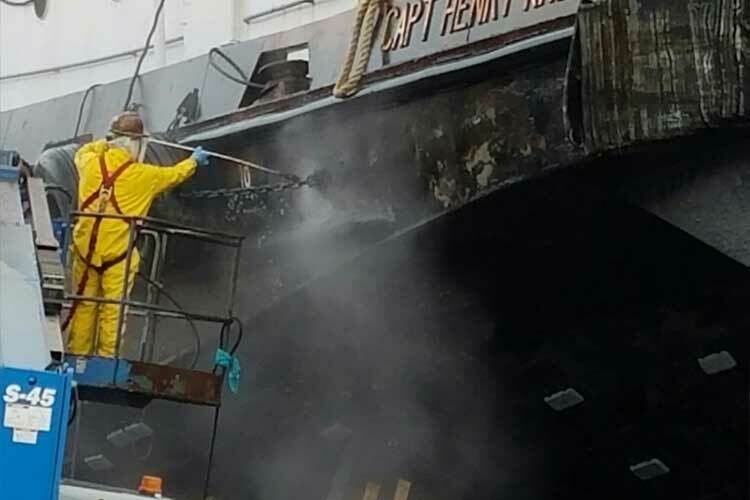 Crews in the Downriver Services division pay house calls, working on vessels at the Naval Station Norfolk, Joint Expeditionary Base Little Creek-Fort Story, or at shipyards in Mayport, Florida or Philadelphia. Lyon Shipyard looks to a steadily busy future as more government-related opportunities continue to arrive.